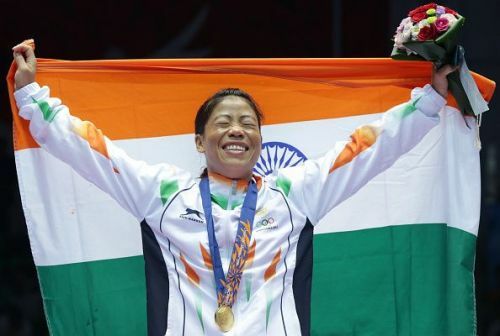 New Delhi, Nov 21 (PTI) Already assured of a record seventh medal at the Women's World Boxing Championships, celebrated MC Mary Kom would look to go one step closer towards her sixth gold when she takes the ring in the 48kg semifinals here Thursday. Out of the four Indian semifinalists, five-time champion Mary Kom (48kg) and Lovlina Borgohain (69kg) will take the ring on Thursday while Sonia Chahal (57kg) and Simranjit Kaur (64kg) will have their semifinal bouts on Friday. The four Indians cannot get a better chance to emerge champions on home conditions, but a lot will depend on the celebrated Mary Kom, who has already become the most successful woman boxer in the history of the championships by assuring herself of a seventh medal. Undoubtedly, all eyes will be on the 35-year-old mother of three when she enters the ring at the KD Jhadav Hall for her semifinal bout against Kim Hyang Mi of North Korea. The 'Magnificent Mary' had beaten Kim in their last meeting at the summit clash of the Asian Championships last year and the Manipuri veteran sounded confident of a win again. "I am confident. I also know when to drop guard and when to attack. I have worked with the coaches and have a plan in place to counter her," said Mary Kom, after a strenuous practice session Wednesday. Mary Kom, who is chasing her sixth gold, will draw her strength from the vast reservoir of nearly two decades of boxing while the North Korean's USP is her aggression and quick movement which was witnessed on Tuesday when she pummelled her South Korean opponent Chorong Bak. Equally important will be Lovlina Borgohain's performance as the country would be looking at young pugilist to beat her Chinese Taipei opponent Chen Nien-Chin and progress to the final round. The welterweight category (69kg) boxer had done extremely well throughout the championships and was particularly good against Australia's Kaye Frances Scott, a Commonwealth Games bronze medal winner, in the quarterfinals. The Assamese boxer will also get a chance to avenge her only loss to the Chinese Taipei opponent. Borgohain feels she has matured as a boxer and can think on her feet now. "I was inexperienced last time when I took on her. But I now know how to tackle her. I did watch some of the video clips to know her style of boxing," said 21-year-old. Two other Indians in fray, Sonia (57kg) and Simranjit Kaur (64kg) will turn out in their semifinals on Friday, and both were prepared for their respective bouts. "I have beaten my North Korean opponent (Jo Son Hwa) once before. But both of us know each other's style. I am confident of winning because I have worked with the coaches on my strategies," said Sonia. Simranjeet added: "I have worked hard and am prepared well for my bout." In tomorrow's semifinals, bouts in five weight categories – 48kg, 54kg, 60kg, 69kg and 81kg – will take place while the remaining five are slated for Friday.